We at St. Jude's are dedicated to teaching the Roman Catholic faith to your children. In conjunction with the guidelines of the Diocese of Wilmington, we offer classes to all children of registered parishioners in Kindergarten through 10th grades. Families are offered a choice of three sessions, which are held in the Religious Education Center, beginning around the third Sunday in September and running through the first Sunday in May. This year classes will start on Sunday, Sept. 23. Kindergarten - 9th grades meet Sunday morning, 11:45 a.m. to 1 PM. Kindergarten - 10th grades meet Sunday evening, 5:30 - 6:45 p.m.
Kindergarten - 8th grades meet Monday evening, 5:30 - 6:45 p.m. In order to cover the cost of materials, we ask an annual fee of $60 for one child, $80 for two children, and $100 for three or more children. Financial assistance is available. Families new to the parish, or families who have children entering Kindergarten or 1st Grade, are invited to register their children for Religious Education Classes by calling the Religious Education office at (302)644-7413 for an appointment. A copy of your child's baptismal certificate need to be brought with you to your appointment. Our volunteer catechists (Teachers), helpers, and building monitors are required to have a background clearance and to comply with all provisions of For The Sake of God's Children, the safe environments Plan for the Dioceses of Wilmington. Catechists attend classes and workshops in order to fulfill diocesan certification. We use the Finding God series through Loyola Press for grades K-8. This program presents the authentic teachings of the Catholic Church through active-learning techniques that allow children to participate, learn, and grow in faith and discipleship. 9th and 10th graders study God's revelation through biblical study and the Youth Catechism. Children in 2nd grade or above who have had at least one year of Religious Education may prepare for First Reconciliation. Children who have received their First Reconciliation may then prepare for First Holy Communion. Preparation for both sacraments includes weekly classes, two retreats, and a home preparation program called "Believe, Celebrate, And Live" which they work on with the parents. Parents are also asked to attend a preparation class for each sacrament and to have a scheduled meeting with the pastor. A small materials fee is requested. First Reconciliation usually takes place the first Saturday of December. First Communion celebration is held in late April or early May. Students begin the two-year Confirmation preparation process in 9th grade They are required to attend weekly classes, a yearly retreat and field trip, attend a scheduled meeting with the pastor, and faithfully attend Mass and partake of the Sacraments of Reconciliation and Holy Eucharist. Our curriculum stresses the importance of prayers. Classes begin and end with prayer and prayer services are held monthly for children and parents. These include Opening Day, Blessing of Animals, Litany of the Saints, Epiphany Blessing, Benediction, and May Procession. Children are also offered a Youth Reconciliation Service in Advent and Lent. 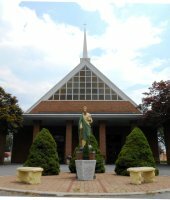 St. Jude The Apostle Parish is committed to providing religious formation to all children of our parish. Please let us know if your child has a special need in the classroom. Our Religious Education program supports parents in their role as the primary educators of their children in the faith. We encourage you to make sure your children attend weekly mass and receive the sacraments of Reconciliation and Holy Communion regularly. There are numerous opportunities parents and students to use their time and talent! Please call the Religious Education office for more information.